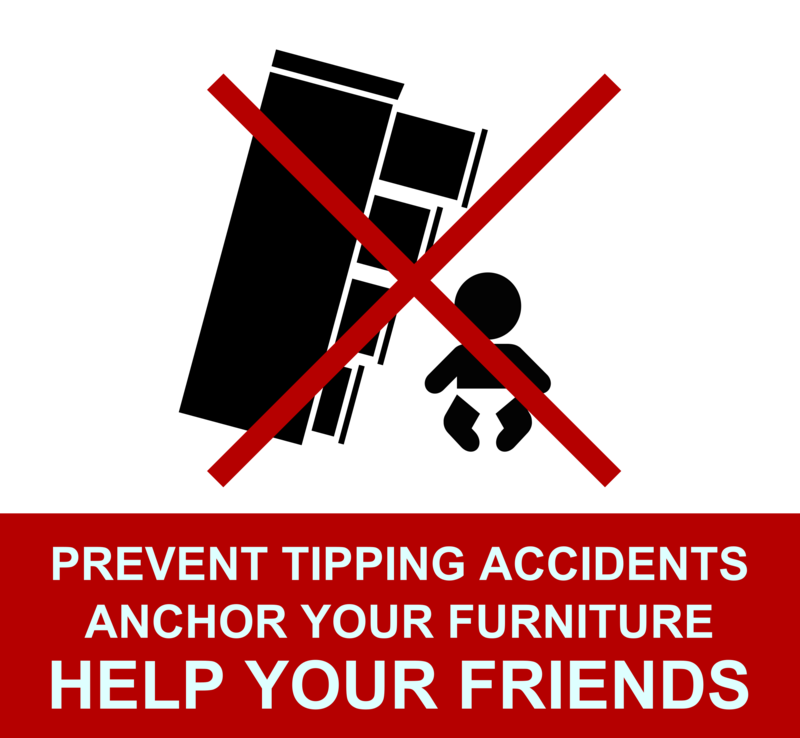 Prevent tipping accidents - anchor furniture around kids! I read that IKEA is recalling dressers because people don't anchor them to walls and the dressers fall over and crush little kids, and wanted to write this post about my feelings, and I hope it gets shared a bit. The IKEA recall is a step, but recalls aren't 100% complied with and IKEA is only one company. The page Meghan's Hope reported this year that 70 kids a DAY are injured or even killed by falling furniture. The founders of Safe and Sound with Amaya said in an interview that a fatal accident occurs every 9-11 days. Similar statistics get posted in places like Kate's Foundation for Child Safety, Brace It For Brayden, Curren Collas Our Blue Eyed Hero... on and on and on. It's not just IKEA furniture - it's everybody's furniture, dressers, shelves, TVs. How many of you know a family that experienced one of these accidents? And from what I've read, the injuries could have been prevented by just securing furniture to a wall so it wouldn't tip over. A few years ago I read another sad toddler death story on Facebook, looked around, and realized that I had furniture anchor kits just laying around in the dresser drawers they came with, doing no good. I also looked at my nutball acrobat of a 2yo and realized she was definitely a candidate to be the next Facebook memorial page. So I stood up. I got my drill and a stud finder, went around and secured everything I could find in the house. Are my kiddos 100% safe in the world now? Oh gosh no! The world is scary and dang it these kids have no sense of self-preservation, I am still worried sick! But at least I did one little easy thing to make them less likely to be killed by falling furniture. I thought I might want to rearrange the furniture someday. Didn't feel like looking for the drill. I wondered if my husband could get around to it. Those excuses might sound funny and relatable but if an accident happened, and I was in the ER with my baby, THEN which of those excuses would make sense? So here's my campaign: I don't want anything to stop any of my friends from having furniture secured to the wall. Need a drill? Borrow mine! Not handy? I can help you! Can't make the time? Let's set an appointment together to hold each other accountable! I'll bring the hardware, you bring the chardonnay, it's a date! I am not a professional childproofer. But DIY wall anchors have been shown to prevent accidents so let's take this step together as a start, shall we? As moms we talk about all kinds of things. We know which of our friends breastfed for two years, who feeds their kid all organic foods, who will lend us a Baby Bjorn to compare to our Ergo. But when do we sit around the table and ask who's got their cordless screwdriver charged up to anchor some furniture while we're thinking about it? If we're going to give each other advice, how about we start with the important stuff? TELL YOUR FRIENDS if you are also willing to help them anchor furniture. You don't have to be an expert. You don't even have to do it for them, if you're not liability-proof-confident in your skills, maybe just put the offer out there that they can borrow your tools or you'll professionally BUG them to do it, that's something! I just want to talk about it and knock down everybody's excuses. No more hurt babies, okay? Help each other! Concerned citizens with drills and screwdrivers, visit your neighbors, share the tools, open the dialog and help each other out. I love your approach to this issue. Fantastic response. Heck, I'm not a toddler and I've had dressers tip towards me because I had the top drawers open and too loaded. All these things to think about when you're a parent make me wonder what stupid-yet-dangerous stuff I wouldn't even think about if I had kids that would be inadvertently putting them around more risks. We have much of our furniture anchored because we have monkey children. We haven't done the night stands, but they're short and squat and much less of a tipping hazard than a chest of drawers or the entertainment center. Part of me still has the reaction of "why is it the maker/store's fault that YOU didn't properly secure your child's furniture? I don't think we've bought any furniture that doesn't come with a little wall anchor kit and if you decide you want to move it later a spot of spackle covers the hole nicely. I wondered this too! It would be like Ford recalling cars because people weren't wearing the seat belts in them, right? How much can they do? We have a Jeep Grand Cherokee that has a recall on it and we got the notice yesterday. Apparently if you leave the car running, in gear, and have the parking brake off your car might run into things should you take the foot off the brake and exit the vehicle. The shifter returns to neutral rather than being in a set position for each gear, but the display panel is pretty clear and I don't see how you wouldn't notice unless you were jumping rapidly out of the vehicle. Needless to say we're passing on the software upgrade that puts it in park if you the driver's door is open. This very problem is how Anton Yelchin of the Star Trek reboot films died. He apparently left the car running, thinking it was in park, while he got out to get his mail. The car rolled down the driveway, crushing him against the fence gatepost. I heard about that and it is tragic. They were talking about a software update before his accident and so it was already in the works. Personally, after two years of driving the vehicle I don't see how it happens unless you're exiting the vehicle while your foot is still on the brake. I guess I have seen people get out of their cars this way and it doesn't give you a chance to feel if the car is fully settled. Maybe it was growing driving up with a manual transmission and having to set the handbrake, but taking that half second to be sure the car is stationary before stepping out is just common sense to me. We actually own two of that dresser being recalled. It has been in the news for years. The problem isn't just laziness though. Along with having 1890's plaster walls, the woodwork at the bottom of the wall means that the dressers are too far from the wall for the IKEA kits to be useable-- it would have been impossible to mount our dressers using their stupid little kits. The kits only work if you can get the dresser flush against the wall. We kept being like "WE need to hire a handyman expert to figure this one out..."
Then we had a near-tipover! It was very scary. We hired the handyman and he did a great job. But most of my friends don't mount their furniture, and even though I know there are all sorts of reasons (renting, complex woodwork, owning antiques, Victorian-era walls, etc.) it drives me nuts sometimes. I noticed this problem with some IKEA furniture. I noticed that Billy bookcases have a cut out on the botttom to accommodate baseboards - but I guess it isn't universal. Also we mounted some smaller ones ourselves into a stud using a L-bracket, and one night in a fit of rage my 4yo still tore it out of the wall! Sigh. Great post. My younger daughter pulled down the dresser years ago and it could've really hurt her, except that it was inside a closet, so couldn't fall down. I was really freaked out, but we rent from a complex, and we're not allowed to just start drilling holes in walls. So instead, I bought plastic dressers. They are ugly, but they won't kill her. we didn't anchor our furnitures because we rent and we figured our owners/management would not like it - only holes are picture frame holes. But heck, they would not want to have injured kids on their hands because of this rule and so we did it in our move. We also had gotten a dresser from IKEA just around the time of the incident and they had this thing that their delivery folks will only install if we anchor them. If not the policy is they won't deliver/install it. I don't anchor because I've never had anything fall and don't have kids... and I'm short and lazy. We have those dressers. We ordered the kits.